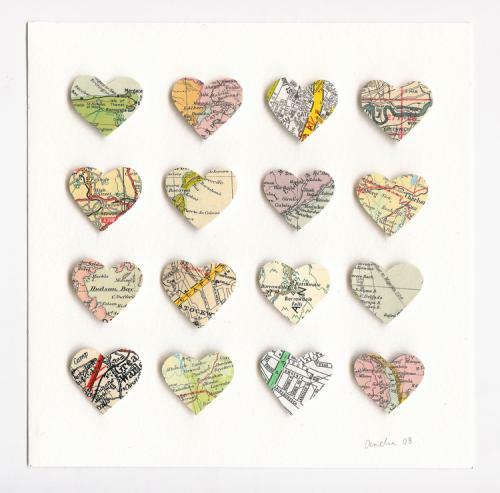 I found these map hearts on lanalou, and I think they're fantastic. 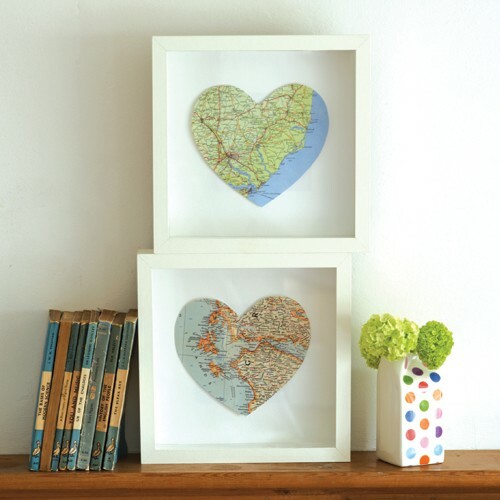 Can't believe I haven't thought of this before - Q & I both love maps - so why not make heart shapes out of memorable places we've been? I'd like to make & frame one from our honeymoon. You can also buy them, with the location personalized for you out of vintage maps, here. ooohh, how great! I LOVE maps and globes...and your idea about doing this from the maps from your honeymoon. I think I will do that too-- we went on a Mediterranean cruise, where did y'all go? This is one of the greatest ideas ever! Where did you go for your honeymoon? We went to St. Barts! I just love honeymoons as they are seriously one of the best vacations! Bsmithhill- Mediterranean cruise sounds amazing! Love this idea also. I want to check out their site. Thanks!! how cool! we like maps too! i'll have to totally do this. now what location to choose... thanks for sharing Alli! This is a wonderful & so personal too. Even the types of maps that are used are so colorful. what a sweet, calorie free idea! We went to Italy for our honeymoon, but it would be fun to do a little collage with all of the places we have been to or lived in. Alli, that is such a cute idea. I love it. we saved our travel books and maps, and I definately want to do something with them! Fabulous idea Ali, we went to the Maldives, so I'll do that. Will also do one to commemorate our upcoming trip to France and Portugal. PS LOVE the quilt as well, wish I had the patience to make one!! Brilliant idea Alli - I had seen these on NOTHS but thought they were a little expensive. But now you have inspired me to make my own, thank you. What a great idea! I like the idea of displaying maps of meaningful places like spots you've visited on holidays.